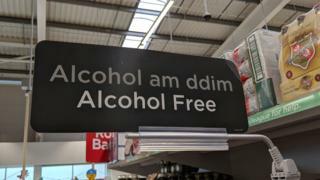 Image caption The sign - which should read "di-alcohol" - in fact says "alcohol am ddim" which means "free alcohol"
An Asda spokesman said: "Mae'n ddrwg gennym [we are sorry]. We would like to thank our eagle-eyed customers for spotting this mistake. We hold our hands up and will be changing the signs in our Cwmbran store straight away." The supermarket confirmed there would not be free alcohol in stores this weekend. Mr Aaron told BBC Wales: "To be fair, for a private company, Asda's signs are usually correct so when there is an unfortunate mistake like this, you just have to laugh. "At least they've turned their self-service checkouts to Welsh. "I have much more of an issue with the way the sign looks than its content. They have chosen such a dark font for the Welsh to ensure it's practically invisible from afar, it feels deliberate." Mr Aaron said people were quick to blame Google Translate because of "how bad it used to be". "While far from perfect, that has improved a lot, and as it happens Google Translate is able to correctly translate 'alcohol-free', so how on earth Asda has ended up with 'alcohol am ddim', I don't know." It is not the first time an incorrect Welsh translation has ended up printed on a sign. In 2008 Swansea council memorably published an out-of-office response on a road sign reading: "I am not in the office at the moment. Send any work to be translated". Image caption You're not the first, Asda: Swansea council put up a road sign saying: "I am not in the office at the moment. Send any work to be translated"